In Greater Miami, we are surrounded by water, and yet there are so few ways to access the bay. That’s why I was excited a few years ago when a friend told me about his favorite spot in Coconut Grove, close to where I live. 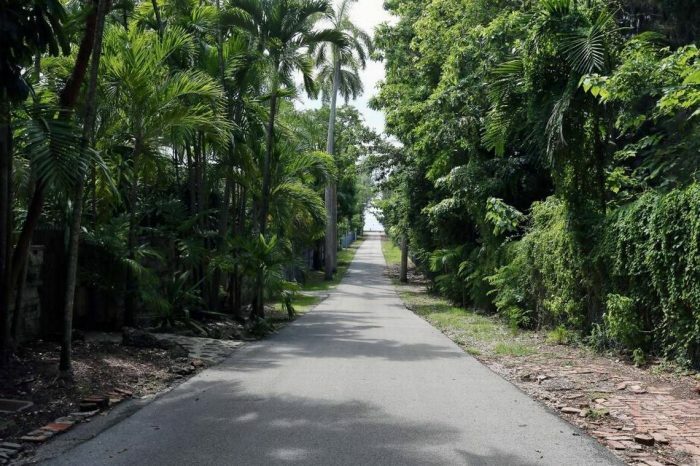 At the end of tree-lined Royal Road is a small piece of land that’s vacant without much to it, except for the fact that it’s a rare public space where you can take in views of Biscayne Bay. The first time I went looking for it, I biked over and down the “big hill” that’s there with my fishing pole to escape the city for a bit. I didn’t catch a thing, but it didn’t matter – I’d found a new little gem where I could take in Greater Miami’s outdoor beauty. Flash forward to this spring, I was thrilled to see a Public Space Challenge idea that wanted to transform the empty plot of land into a neighborhood mini park so that everyone can enjoy the view with greenery and seating instead of the dirt and litter that’s there now. Pictured above: The Royal Road Project, a 2017 Public Space Challenge winner. This project will convert the city-owned right of way at the end of Coconut Grove's Royal Road to a designated mini-park. Today, the Royal Road Project is named one of 21 winners in the 2017 Challenge, sharing $350,000 to create, improve or activate our gathering spaces, and advance our goal of having a public space within walking distance of every Miamian. The winners range from colleges and established organizations to nonprofits and individual Miamians from all across Miami-Dade. Many of their projects seek to benefit places like Royal Road – hidden gems, right beneath our noses, waiting for someone to make them shine. 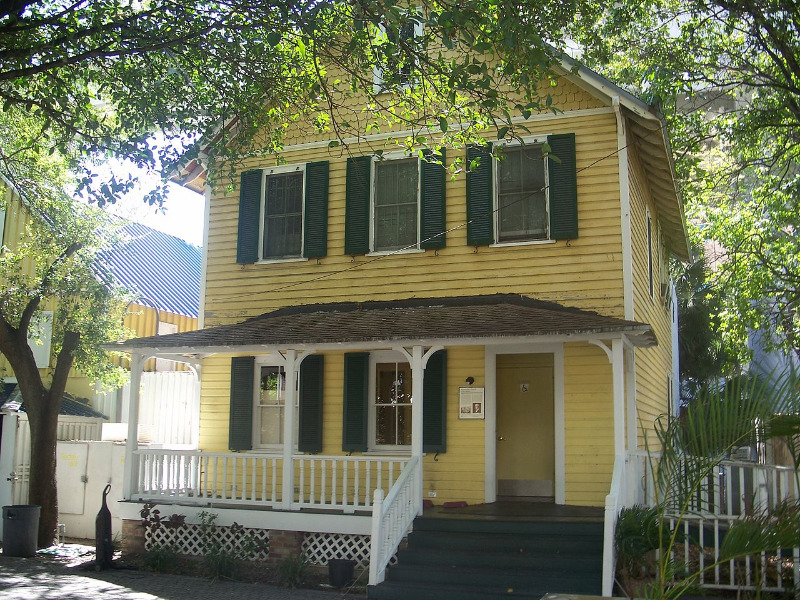 Pictured above: Palm Cottage in Fort Dallas Park in Downtown Miami. 2017 Public Space Challenge winner Dade Heritage Trust will reactivate this park and building, associated with Henry Flagler. In downtown Miami, for example, the Dade Heritage Trust wants to reactivate a park that hasn’t seen use in years. On it is Palm Cottage, the last-known Miami building associated with railroad magnate and developer Henry Flagler. It used to house a restaurant, now shuttered. The trust wants to bring the public park back to life and restore the historic building with a café and bike rentals, so that more people can experience the Miami River greenway. Pictured above: a light in the Annie Coleman public housing units. As part of a 2017 Public Space Challenge winning project, local residents will now have local pathways lit. Nearby in Little Havana, Miami Dade College, InterAmerican Campus aims to repurpose part of a parking lot into a natural oasis, complete with a Pine Rockland relaxation space, sidewalks and community activities. 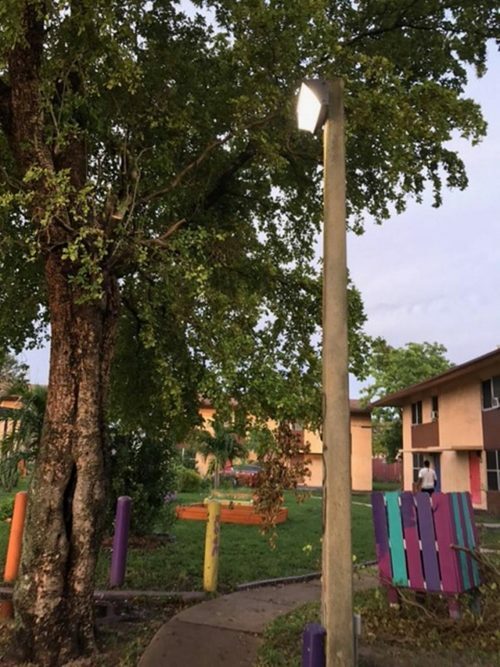 Over in Liberty City, residents are working to get new lights in their neighborhood, so that kids can feel safe playing into the evening on a beautiful playground built a few years ago by the community. This year, we were also delighted to have support for the first time from Target, which is funding four ideas that promote healthy eating and active play, and from West End (WE) Go Green, which is supporting projects in West Kendall. The Target-backed winners include the Virginia Key Bicycle Club, a volunteer-run organization that is single-handedly rebuilding bike trails on that island for families from across the county to appreciate. Meanwhile, in West Dade, we’re looking forward to seeing projects get more people outdoors and playing soccer. As we celebrate The Miami Foundation’s 50th anniversary, building a more resilient Greater Miami is one of our top priorities. We are constantly looking for ways to help make the community stronger and more able to positively adapt to change and recover in tough times. Everyone who participated in this year’s Public Space Challenge is helping to accomplish that by actively connecting with their fellow Miamians and pushing for improvements in their neighborhoods. Together, we’re creating spaces for a strong, thriving city. All of the winning ideas add momentum to Miami-Dade County’s Parks and Open Space Master Plan, supplementing the four pillars of the plan: Parks & Natural Areas, Greenways & Blueways, Safe Routes to Parks and Public Space. As partners in this year’s Challenge, officials from the county’s parks department helped us select the winning ideas, which get us a few steps closer to having a great public space within walking distance of every Miamian. Take a look at the list and see what your neighbors have planned for all of us. 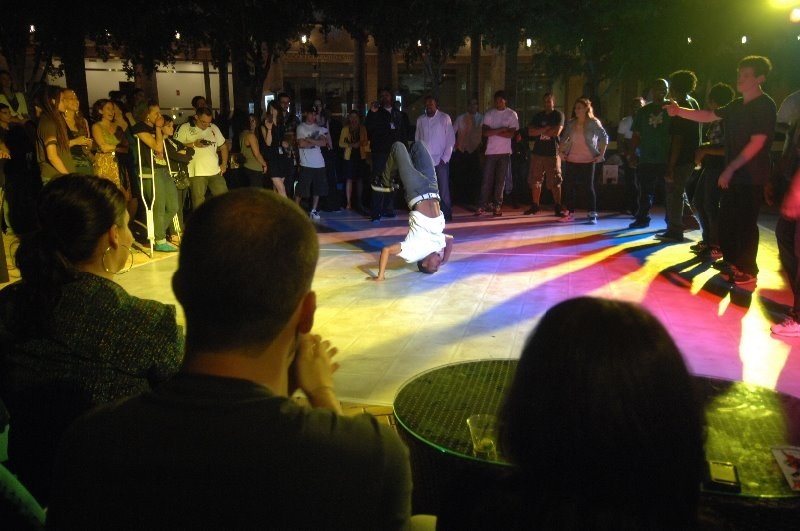 We bet you’ll find some hidden gems among them that will help you enjoy Greater Miami even more. Stuart Kennedy is director of program strategy and innovation for The Miami Foundation. Way to lead my friend! Proud of you and TMF. Congratulations to the Miami Foundation leadership and all the wonderful individuals who participated in the Challenge. Well done! Big shout out and thank you to The Miami Foundation for supporting the Virginia Key Bicycle Club, this will surely be apppreciated by all the community and visitors. Thank you, thank you, thank you !!! Thanks for supporting the Virginia Key Bicycle Club. There efforts have created much enjoyment for my family. I just learned that the Virginia Key Bicycle Club was selected for a grant via your Public Space Challenge! Excellent selection & thank you!! Who would have thought that you could attract thousands of hobbyists, families, athletes, racers, and businesses etc to spend time on a former dumping ground -adjacent to a waste water treatment facility (along with its corresponding aroma) but that is exactly what happens several times a month! Your grant will be put to excellent use and fund additional features to this already healthy, fun, safe and natural facility for family and sport! We hope to see you at the trailhead – please stop in and say hi & enjoy what the city of Miami and a few hundred + volunteers have created for us! Ride often & ride safe! Another great round of projects! Congrats Stuart and the Miami Foundation for taking the lead on this initiative, and bringing others to the party. Another great round of projects! Congratulations Stuart and the Miami Foundation for taking the lead on this initiative, and bring others to the party. Thanks to City of Miami and The Miami Foundation to support Virginia Key Bicycle Club. Always helping families to move to this beautiful mountain bike sport. !!!!! T H A N K S A G A I N !!!!! Wow, what a great initiative with benefits to all Miamians! I hope The El Paso Community Foundation will model a similar program one day. Congrats Stuart! Phenomenal project! You’re doing great work! Can’t wait to see these projects popping up around Miami. Desperately needed! The Virginia Key Bicycle Club would like to congratulate all of the winners of the 2017 Public Space Challenge. We would also like to thank The Miami Foundation, Target, Urban Impact Lab and our members for making this possible. VKBC is proud to give back to our community. Great job everyone! Thank you!